As you can see, it takes no time at all to transform your look from “day” to “night”. If you’re interested in seeing more “day-to-night” looks, head over here to check them out. 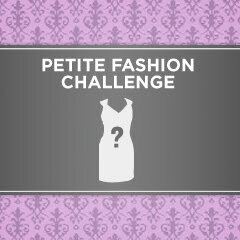 Thanks, Ski Petite for hosting this month’s challenge. Sydney I love it!!! The dress looks completely transformed!! That 1.5 hours was worth it LOL! I also love how you displayed your photos! haha, we kinda went the opposite direction as far as how we transitioned from day to night. i love this pretty pleated dress and the belted blazer looks great! Those shoes would so not work as a tourist in a big city with a lot of walking. But you look great! Blue is your color Sydney. The dress is absolutely gorgeous on you! Great transition from casual daytime to dressy nighttime! Great looks! I loveee the dress. This colour compliments your skin tone so well. Gorgeous! That dress is stunning! I love what you did with all your accessories! change of belts=genius!! this dress is absolutely adorable and sooo picture worthy! You pulled this off during your lunch break?? I tip my figurative hat to you on a job well done! Love that you even thought of the handbags! Gorgeous dress... you look lovely! You did so well for this challenge Sydney, I like both the day and night looks! I love that necklace in your nighttime outfit - a statement for sure, but it doesn't overwhelm your frame in the least. Great challenge response!! What a great transition. I love the color of that dress. All the accessories you've used are so pretty. I always have a tough time packing for vaca as I tend to overpack and then end up not wearing what I bring. Will have to look into pairings so I can wear one outfit twice like you've done here. Thanks for sharing. the night look is one of my favorite looks on you. u did an amazing job from tranforming from day to night! great posts! your dress is really pretty! I absolutely adore that blue dress...it looks great with the belt and the jacket. You look adorable in these photos, I like your style! enter the ZELEB giveaway on my blog! !